Thomas Durant was a born manipulator. Educated in medicine, Durant kept the honorific "Doctor" in front of his name but abandoned the pursuit for business, the only enterprise that could satiate his rapacious appetite for profit. In 1854 Durant founded the Missouri & Mississippi Railroad. Little got built, but ownership poised him to seize the burgeoning Pacific Railroad initiative. By that time he had made a fortune smuggling contraband cotton from the Confederate states with the aid of Grenville Dodge. Investing his earnings in an underhanded subscription scheme, the Doctor secured control of the Union Pacific. He assumed the vice presidency and named an associate as figurehead. Immediately he disregarded ethics. When Abraham Lincoln named Council Bluffs, Iowa, as the eastern terminus of the railroad, Durant instead sent surveyors across the river to Omaha, where he held property, avoiding the cost of a big river bridge. Durant announced that the Union Pacific would connect to his own M&M line, causing M&M stock to rise sharply. He sold his shares discreetly and bought stock in the competition. A new announcement declared the connection would be the Cedar Rapids & Missouri line. Investors flocked to that company and divested themselves of M&M, which Durant bought back at low cost. "In other words, he gets back home and makes in the roundtrip for him and his friends $5,000,000," wrote Dodge's brother Nathan. "It is the smartest operation ever done in stocks and could never be done again." Crédit Mobilier was Durant's next tool for milking the railroad. Durant paid an associate, Herbert M. Hoxie, to submit a construction bid to the Union Pacific. 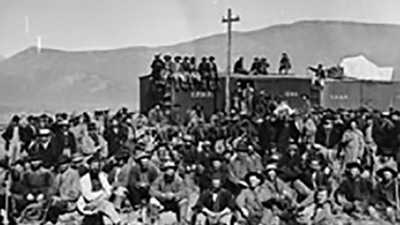 Durant's attorney drafted Hoxie's proposal, which the Union Pacific board then approved under Durant's leadership. Hoxie handed over the contract to Durant, who transferred it to another company, the Crédit Mobilier. 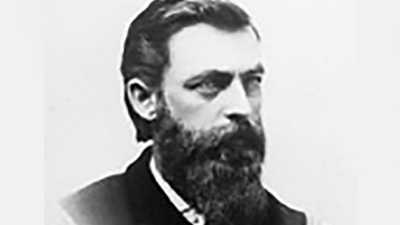 Having established himself as contractor, Durant was free to divert Union Pacific finances to his gain. It mattered little whether construction ever got underway. But each mile completed represented additional government subsidies, so Durant hired Dodge as chief engineer and Jack Casement as construction boss -- hoping the former would lay long lines and the latter complete them quickly. Durant was a capricious leader. He often squirreled away resources, even as they grew increasingly crucial to the railroad's completion. He repeatedly acted without consultation, renewing contracts or brokering deals without approval. And why not? As far as the Doctor was concerned, he was the Union Pacific. When board members contradicted him by electing investor Oliver Ames president, and later sought to wrest Crédit Mobilier from the Doctor, an infuriated Durant paralyzed the railroad with litigation. Calm maneuvering sometimes gave way to explosions of temper; during one episode he physically assaulted a director in the boardroom. But Durant's opponents realized they could not get rid of him, especially when he threatened to ruin them by revealing their unusual corporate procedure to the public. "It is one of the miseries of our Road that we have a man in it who is so desirous of Power and so jealous of every act that does not coincide with his notions," Ames wrote Dodge. The general was bound to agree. Once on the line, Dodge found Durant an impediment. The Doctor's pilfering was siphoning money from construction and delaying Dodge's progress. Durant in turn complained about Dodge's slowness. He made erratic decisions about the route, undermining Dodge's studied proposals, and sent underlings to enforce them. It was not unusual for the engineer to return from a survey or from Washington to find the road being graded in a manner contradictory to his instructions. Durant's "General Order No. 1" of 1868 superseded Dodge's authority by ceding it to the consulting engineer in his absence, and it rescinded Dodge's ability to overturn Durant's manipulations upon discovery. It was a blatant attempt to force acquiescence or resignation, and the engineer exploded at the man "who has not an honest drop of Blood in his veins, who is connected with the Co. for the sole purpose of bleeding it and who the Co. say they cannot discharge for fear he will Black Mail it." 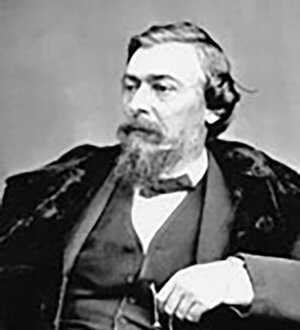 At times, the manipulation bordered on mania: in 1869, when Dodge was in Washington lobbying fiercely to keep the Union Pacific afloat, Durant threatened to suspend him for his absence. The Doctor remained ever slippery. After the lines joined at Promontory Summit, Utah, Oliver and Oakes Ames prepared to oust Durant once and for all. Durant beat them to the punch, however, resigning his position, moving onto new railroad projects and new fields of plunder. Nitroglycerin was first synthesized in 1864 by chemist Ascanio Sobrero, who destroyed his notes for fear of the damage his highly unstable discovery might cause.